The government is committed to improving the safety of public transportation in the country, the Minister for Planning, George Gyan Baffour has said. 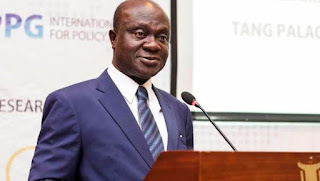 Speaking on behalf of the President at the 2018 Ghana Driver and Road Safety Awards, the Minister for Planning, George Gyan Baffour noted that the government will aggressively pursue sky train to complement transportation and reduce road accidents. Ghana’s transport sector is primarily controlled by the private sector with the government controlling a small portion with Metro Mass Transit, Intercity STC and until recently, the Quality Bus Service also known as Aayalolo. “Government acknowledges that the current road safety situation is far from satisfactory and we are committed to build strong and effective partnerships that will endanger significant improvement in the road sector,” he added. The government about two weeks ago signed an agreement with a South African group, Africa Investment (Ai) Sky Train Consortium, for the construction of the Accra Sky Train Project. Railways Development Minister, Mr. Joe Ghartey, who signed the agreement for Ghana said the Sky Train Project was the solution to the ever-increasing road traffic congestion in Accra, with its detrimental effects on economic activity, pollution and the quality of life.